Do you work magic with herbs? Do you use them in spells, for talismans or simply use their innate powers? If you don’t have Cunningham’s Encyclopedia of Magical Herbs, you need to get it right away. This book has become a classic in its field. Paul Beyerl, a respected author on herbs calls it “…an essential reference book by students of herbalism and magick alike … Scott’s personable charm touches every page… I highly recommend this book.” And Jeanne Rose, famous author of books on herbs and developer of an herbal course says “I love books like this … It is accessible, easy to read, and with its encompassing index (all too often neglected), simple to use as well.” Over 200,000 people already have this book and use it frequently. 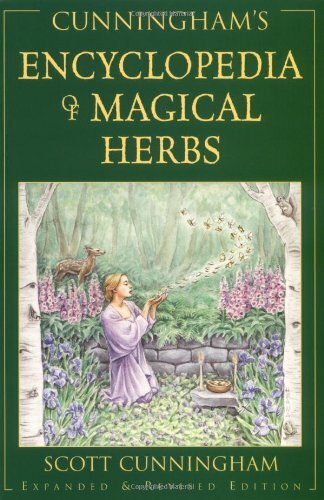 In this edition of the book (it’s expanded and revised on the 15th anniversary of original publication) you will find the magical properties and folklore of over 400 herbs! You’ll also find lists of herbs based on their magical powers, their genders, their planetary rulers, and more. Perhaps the most important list is the folk name cross-reference. With that information, when a recipe calls for “bramble, ” you’ll know it needs blackberry. Or if the magic calls for “enebro,” you’ll know you that is juniper.